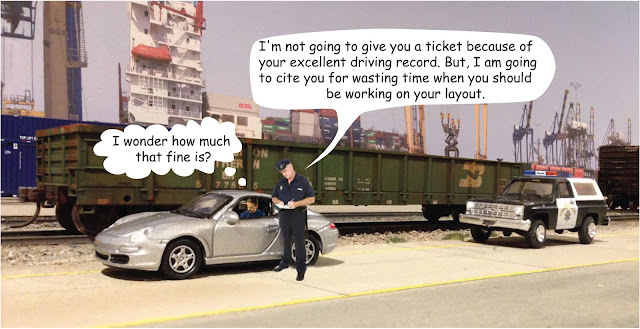 This is not the normal layout design subject that we discuss on this blog, but I thought this was interesting and it related to model trains. In this article, Mark McConnaughay developed an algorithm to automatically calculate all possible unique layout designs using the Ikea Lillabo wooden train sets that includes curved and straight pieces. It is an interesting, brute force approach to the problem that ends up being quite elegant. If you are Python programmer (I am not) you might find the detail described on the blog linked above interesting. The animated gif from his site shows the 16 possible uniques solutions from a basic set of track. The solution does not include turnouts, which can complicate the situation considerably. I wonder if this will turn out to be a new class of computational math problems with a model railroad twist. Any math majors out there want to try for a closed form solution? "Honey, did you put up the Christmas Lights?" "But I don't see them outside." "Outside, I thought you meant on the layout. Oops." Yes, Christmas is the time to put up lights to decorate the house. So I started with the pier shed on the PoLA layout. 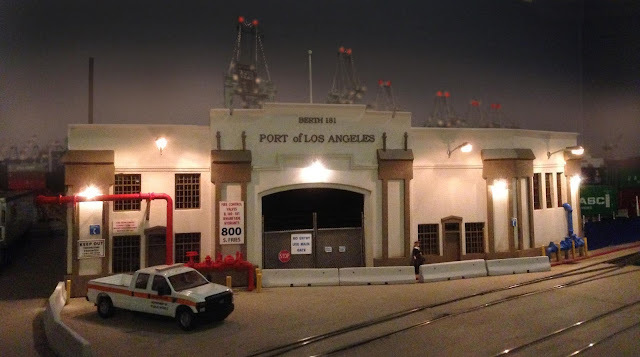 I installed three Walthers Scene Master Modern Short Arm Wall Mount Lights on the walls of the pier shed. There are pretty close to the lights on the prototype. The Walthers lights use 12V. I also added 4 Miniatronics N Scale 1.5V Lamps with shades to represent the smaller lights found on the prototype. Since I had two different voltages, I had to make sure I wired them correctly. The 1.5V lights will burn out instantly if you put 12V on them. I had both a 12V and a 1.5v power supply on hand, so hooking them up was pretty easy. With the lights installed and the final details added, I glued the pier shed building to the layout. It's just about done. Now to work on the pier alongside it. For the non-American readers of this blog, the day after Thanksgiving is called "Black Friday" in the United States. On this day, most Americans suffer from tryptophan stupor induced by over consumption of turkey. So they go crazy buying holiday gifts at major shopping centers. The frenzied crowds and traffic near shopping centers can be incredible. It's as close to experiencing a zombie apocalypse as we reversibly come. of trucks as trains instead. To avoid the insanity, John Drye, Kent Smiley, and I went to on a road trip to do some rail fanning and to stop at our favorite hobby shop, Mainline Hobbies in Blue Ridge Summit, PA. The day started with a visit to Baltimore Harbor. 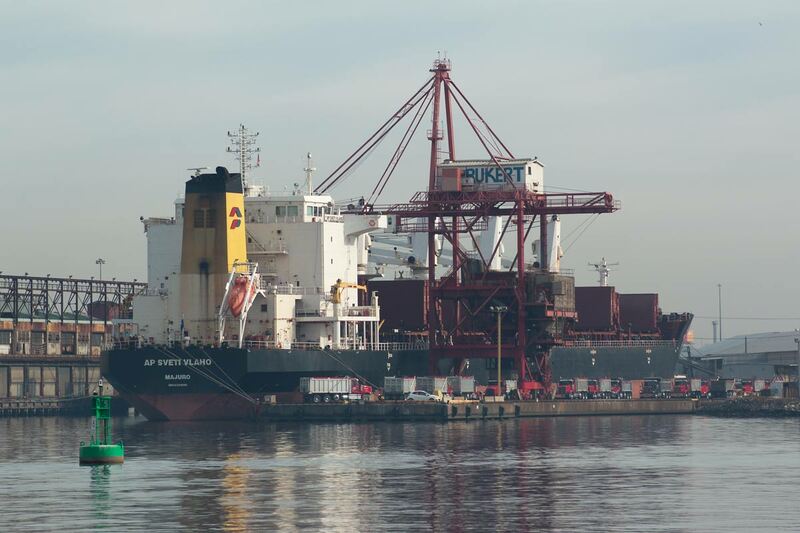 The haze was still present along the water on an otherwise gorgeous day when we arrived at Locust Point. 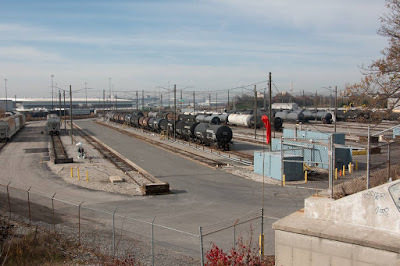 We checked out the Dominos Sugar factory, the TRANSFLO Bulk Distribution Center in Locust Point, and Fort McHenry. as above from the other side. Fort McHenry is a great spot combining intense American history and ship watching. 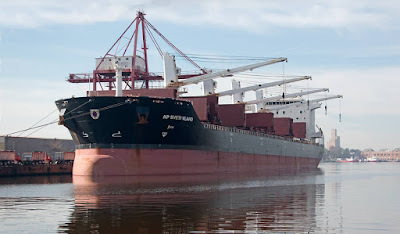 From Ft McHenry one has a great view of the Rukert Terminal in Canton. Alas, the haze and sunlight made photography tricky, but we managed to get some good shots. 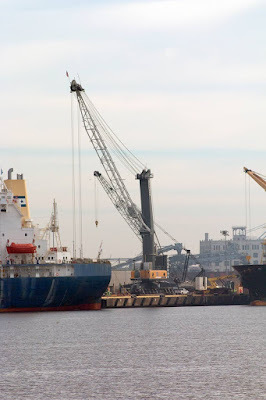 I was especially interested in getting a shot of the Leibherr 500 Mobile Harbor Crane that Rukert recently placed into service. It was barely visible between two ships that were unloading cargo. One had aluminum ingots and the other plywood. 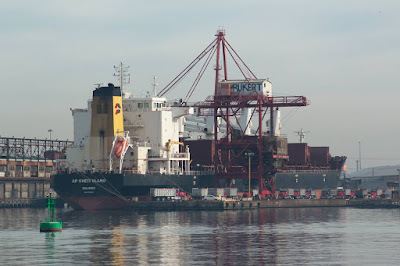 USS Antares - A former SL-7 Container ship now in the service of Military Sealift Command. These are probably my favorite ships. Note the weathered Chessie cars in the foreground. We next went to Canton side of the harbor and got some pictures of the operation from that side. We made sure we talked to the security guards whenever we stopped. Some were cool while others said photography of ships at piers was prohibited. Nonetheless, we got a few decent shots. With some good shots on on memory cards, we headed to Lenny's for corned beef sandwiches. After the tasty lunch we zipped over to MB Kleins to pick up some scenery materials. It was not as busy as I expected. MB Kleins has good prices, but it is hard to shop there as most of the inventory is in the warehouse. You might as well shop there on-line. In fact you order stuff using computer terminals in the front lobby and they bring the stuff to you. So we departed MB Kleins and headed cross the beautiful Maryland horse country following the former Western Maryland Railroad right of way. We drove through the Worthington Valley, an area where my wife has many ancestors. We didn't see any Maryland Midland trains, but our conversation, inspired by the gorgeous scenery, was scintillating- ranging from aging heavy metal rock bands to the geopolitical-military situation in the Mid East. (I'll spare you the details though the consensus was that our current leadership is clueless and AC/DC rocks). Arriving at Mainline Summit we were given a hero's welcome. Brian Wolfe and his staff provided excellent service and a nice discount while we also caught up on the local Catoctin model railroad news. Mainline Hobbies is one of the best hobby shops in the United States. Highly Recommended. We left with smiles on our faces and heavily laden with model train goodies. On the way back to Alexandria, we stopped at Point of Rocks and waited for the Capitol Limited to arrive. In about 5 minutes we watched it roar by. It was the only moving train we spotted all day. The trip concluded with a look at JD's N Scale PRR Horseshoe Curve layout. I got a short video of one of his K4s running light up the hill. It's coming along nicely, but that horn????? 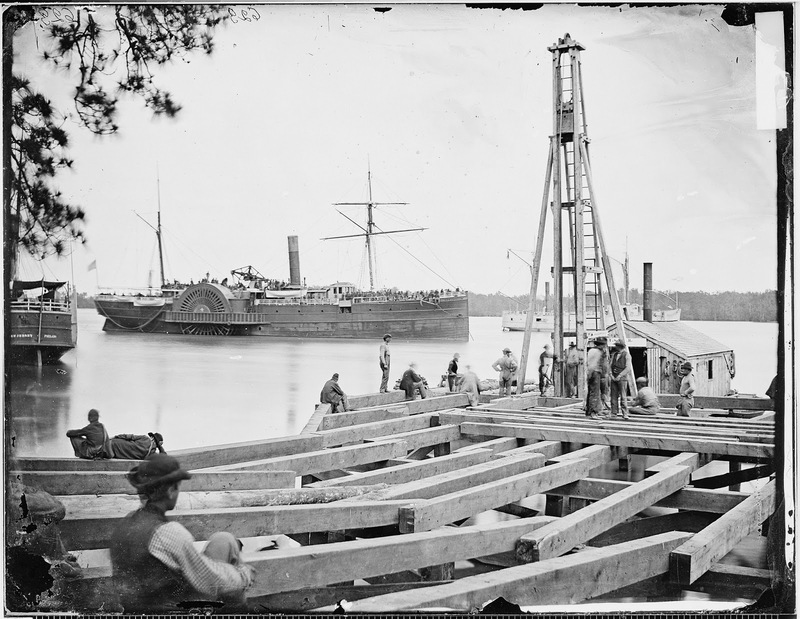 In an earlier post I had discussed the pile driver at Aquia Landing. Rich Hochdel alerted me to a photo at the US National Archives that shows the pile driver in close up detail. This photo will prove invaluable when I start building a model of it for Aquia Landing. High res version is available here. I found a two other images of ACW era pile drivers in my files. Both of these shots show scenes near the railroad wharf in Alexandria. The first shows the railroad wharf with the pile driver on the south side of the wharf. The men in the foreground are constructing one of Haupt's "Arks." The second shot shows the railroad wharf from Battery Rodgers later in the war. We know this because the car ferry transfer gallows have been reinforced with additional posts and beams. In earlier shots there is only one row of posts. The sheds on the wharf are also considerably improved from the earlier images. Also note that there are two pile drivers visible in the image, but both are on the north side of the wharf. 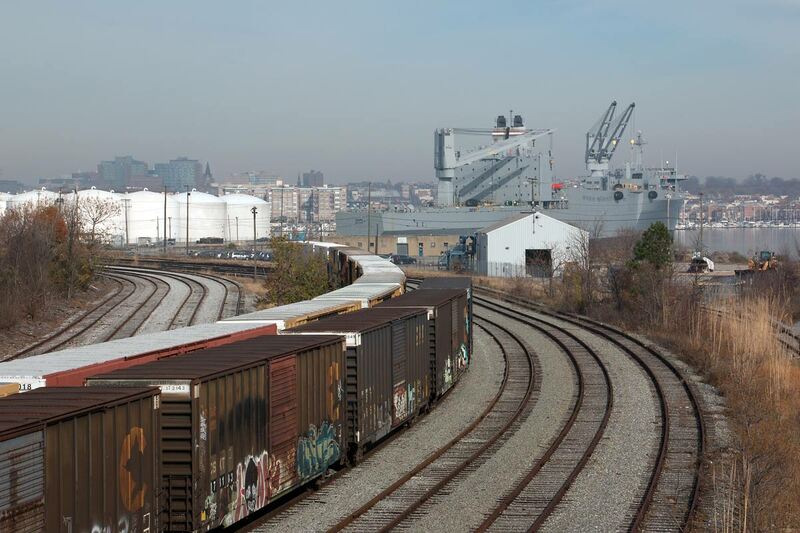 Also of interest is the box car and caboose on the wharf. 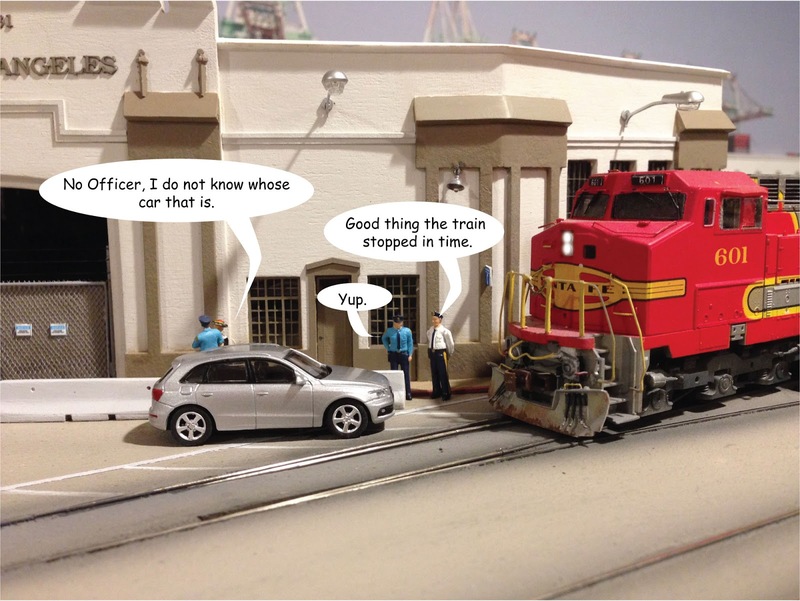 I need to build a couple of those cabooses (also called conductor cars). Test of the PoLA Money Shot with hand-held iPhone. The Maw- Halo players will get this. I added the fence gate to the front portal of the pier shed. I soldered some 0.032 inch phosphor bronze and brass rod to create the gate frame. It is very sturdy. I test fit it so it was a snug fit in the portal. Then I glued an oversized piece of fine tulle fabric (veil material) to the frame using CAA. I then trimmed it to the size of the frame. To trim the tulle I used a sharp XActo knife. Next I primed it gray and then painted the vertical posts silver. To simulated the plastic privacy panels I used a piece of construction paper painted the trim color. I glued it to the back of the tulle. I did not weave it in between the chain links as on the prototype. But I like how the tulle is visible in front of the paper. Lastly I added signs and barbed wire made from lycra string. I did some work on the details for the pier shed. I added some of the signs and made the fire water pipes. 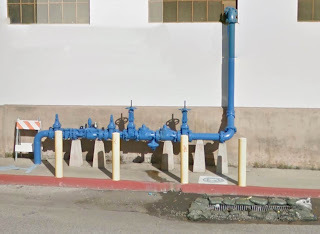 The water pipes for the fire suppression and fighting system were probably add-ons to the building. They make a colorful and interesting detail. Next I need to add the lights, flag pole, some trim, a drain and some fencing. Yes, that is the little old lady from Pasadena. She now drives a Porsche. The red pipes before painting. Mike Spoor visited the layout tonight. Last we saw Mike on this blog he was getting ready to go to Korea. He is now stationed in Ft Hood, but is in town this week for Army intel training. Mike loves to operate, especially switching style layouts. So I set up a op session for him. He is also an excellent operator, so this would be a good test of the layout and ops scheme. Before he arrived I drew up an "official" switch list document. I copied a Sante Fe style sheet, but modified it for the Pacific Harbor Line. 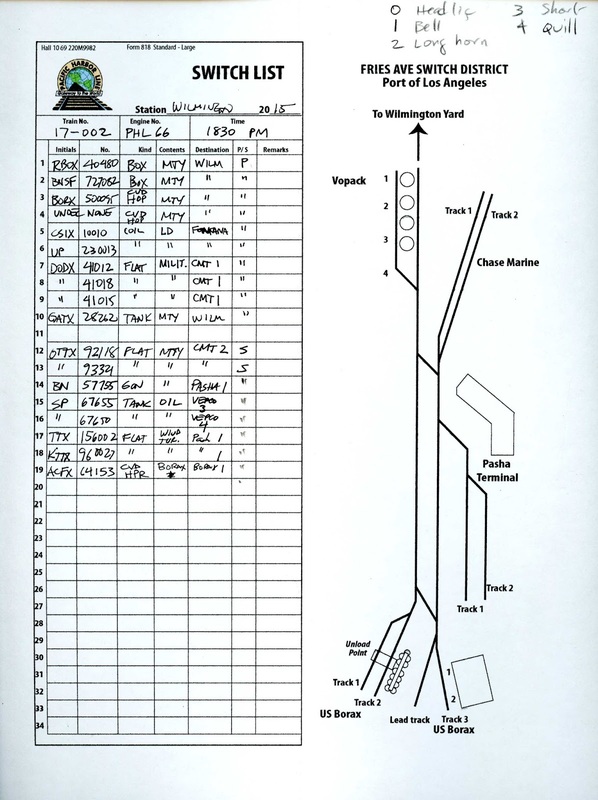 On the right side of the sheet is a track plan showing the track, industry names and the switch spots. The Sante Fe switch list has a column for "tons" but I changed that to "P/ S " for "pick up" or "set out" to simplify things a bit for the conductor. I printed the switch list on heavy stock. With a fold in the middle it is easy to hold in your hand or stuff in a pocket. I filled out sheet with the cars that Mike would be working. Unfortunately, I forgot two cars, but I added them later. I made a hand written note on the top for the horn signals. Seems like all my locos have different decoders with their own horn signals. I plan to modify the form with blanks for the horn signals so I don't forget to add them. Mike seemed to have a good time. He said he "liked the layout." He couldn't stay too long as he had to pick up his boss at the movies. It was nice seeing him again. Hopefully he can get some pictures of Beaumont for my next book once he is back in Texas. While Mike was operating, I worked on the monitor roof for the pier shed. I made the pieces from bass wood with laser cut windows. The roof is flat compared to the prototype that has a slight slope. I started to add a slope, but it was so slight that it was barely noticeable. So I opted to keep things simple and made the roof flat. I glued black construction paper to the roof surface, as I did not want to paint the foam core underlay. I have had painted foam core warp in the past. I did not extend the monitor to the right side of the structure. I think I should, at least as a flat against the wall. I also tried making some Jersey Wall barrier sections. The prototype photos show lots of them in various locations. 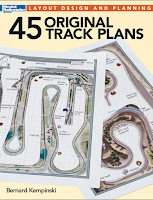 Several people have suggested that I start a blog to discuss my books, especially the track plan book that just came out. While I have tried maintaining multiple blogs in the past, I now prefer to just have one. So if you will bear with me, I am opening this blog to discussions about my books. 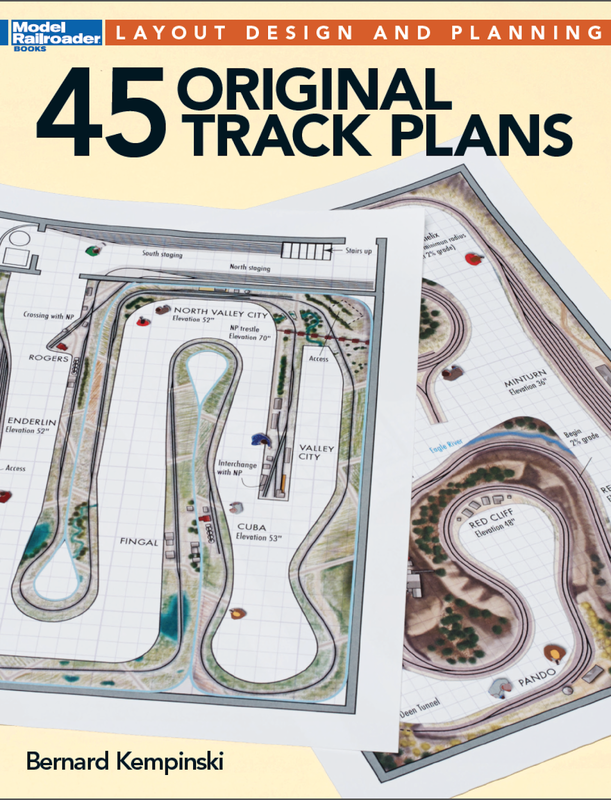 To begin, Trevor Marshall has written a nice review of my latest book, "45 Original Track Plans." See here. In my view, Trevor clearly "gets it." The purpose of this book is to inspire and entertain all model railroaders, from folks in the armchair to those that have already built their layouts. I hope this book does that. My intent was not to provide detailed blueprints on how to build an exact layout. Very few people will have the exact space that I show in the plans. I intended these plans as design studies to indicate the possible. As such I use CAD tools to draw the track and structures to make sure that what I draw could be built. I also use artistic software to present the plans in a pleasing way. Hopefully the reader will enjoy looking at the plans, learning about the prototypes (that is why I included some off-beat subjects) and perhaps find ideas that they can use. I suspect that most modelers will want to adapt any particular plan to the era and railroad to match their space and interests. Trevor's comment about building a plan in the next smaller scale is right on the money. I like the example he used. In my next book I need to explicitly discuss this point, as I agree whole heartedly with the concept. 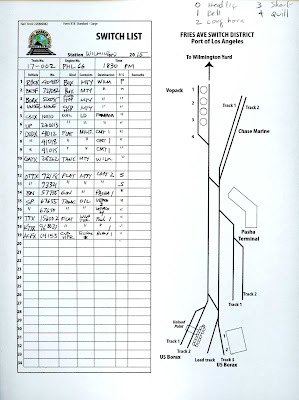 In my first track planning book, "Mid-Size Track Plans for Realistic Layouts" I had a examples that showed how one could model a given subject in different scales. Thus each chapter took an in depth look at one subject. I used a different approach in the latest book, where I covered more subjects, but with only one plan and not in as much depth. Both approaches have their merits. I think I prefer this latest approach, as I can cover more ground. The books are also available at Amazon, and the Kalmbach On-line Bookstore. Sunday Gerry Fitzgerald took a break from writing books about WWI and biological weapons to visit the Aquia line and PoLA. I put him to work doing a test op session on PoLA. I set him up with a mixed train in staging. He brought the train out of the staging in the closet (no, I did not say Gerry came out of the closet). He worked the sidings. He must have been having a good time because he didn't bother me for at least an hour and I did not hear any cars hit the floor. Afterwards, he said, "that was fun. I can't think of anything to change." But that was not true, his experience as the LSIG editor came through, and he thought of something. Later in the evening he started lobbying for an extension of the layout at the Borax factory to allow better operator access to the siding there. I had actually contemplated that myself, that is why I never added a fascia piece to the layout at that end. We shall see how the time line goes, but the change is not needed for the book. He also gently nagged me to get the Aquia Line in operation. All in good time, young grasshopper. All in good time. While he was playing, I mean testing, I worked on the Pier 181 shed. It is nearly completed. Next is the monitor roof, and then the signs, lights and details. This building has a lot of clutter and detail around it, so it should make an interesting structure. I was wondering how to make the capitals on the decorative trim for the pier shed. I tried a couple ideas using laser cut paper and laserboard. But they didn't work out as the side walls of the capitals are too small, and folding the parts was not possible. So in the end, I used small bits of 0.060 by 0.060 styrene glued to 0.30 inch wide 0.020 inch thick styrene. I used wood putty to fill-in the small gaps on the sides. The roof edge trim is 0.060 triangular stryene rod. Work in progress. Here an Athearn SD40 with a TCS Wowsound decoder and keep-alive circuit pulls some Atlas and Fox Valley freight cars past the under-construction pier shed on the PoLA. This is a quick hand-held iPhone video as I was wrapping up for the night. Work progresses on PoLA with the addition of curbs, RR crossings and the start of the pier shed. The curbs were trickier than I expected. I ended up making them with laser cut 1/16th inch acrylic. 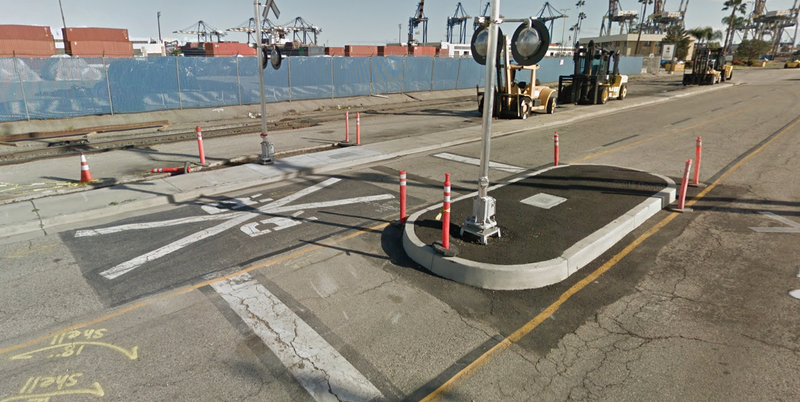 I am trying to depict the grade crossing shown in the photo below. I have run into two problems in developing this scene. First is that the scene has been changed quite a bit since 2005. None of the photos on Google Earth, Bing Maps, nor my own shots show the same details in the scene. Secondly, the prototype road is 4 lanes, but my model road is only 2. So I needed to pick and choose elements to include in the scene. I think the end result is coming along nicely. Next I need to select a electric circuit to control the flashers. Not sure how I am going to do that aspect yet. In the meantime, I drew and then laser cut the basic structure for the Pier Shed. I used 1/8 inch plywood with a foam core roof and bass wood stiffeners. I used a can of off-white latex house paint to paint the basic walls. That worked surprising well. There will be another layer of contrasting color architecture trim, as well as a central cupola on the roof. Like how the ship in the background rises above the walls of the shed. I finished base coat painting PoLA pavement today. Then I started detailing the San Clemente Ave section of the pavement. I followed the prototype photos available on Google and Bing Street views. Prototype area modeled. I am omitting the fence as it is on the edge of the fascia. The avenue in this area has a single lane of jointed concrete and another lane of asphalt, which in many places is in poor condition. I used masking tape and acrylics to paint the stripes. I used a laser-cut mask to cut the "STOP" sign painted on the road surface. I used a colored pencil to draw the joint lines and cracks. I applied Sandstone colored acrylic wash to the concrete area, and a medium gray acrylic wash to the asphalt lane. Next I added small tufts of Silfor grass in the cracks and along the shoulder. Finally, I laser cut some manhole covers and storm drains, again following prototype photos as a guide. I trimmed away sections of the task board pavement and countersunk the manholes and drains into the pavement. Thanks to using task board it was easy to remove the areas below the drains. Looking into a 3D drain is kind a cool. This weekend, I also installed a TCS Wow Sound decoder with the RTG-MB1 motherboard into a Athearn SD40. This board has a keep alive capacitor and associated circuitry. It works great and the SD40 runs smoothly across the layout. Next, I need to learn how to adjust the sound parameters to get that set up for an SD40.